The results are in from Super Tuesday, but the news media is still undecided about what margin of victory one candidate can claim over the other. 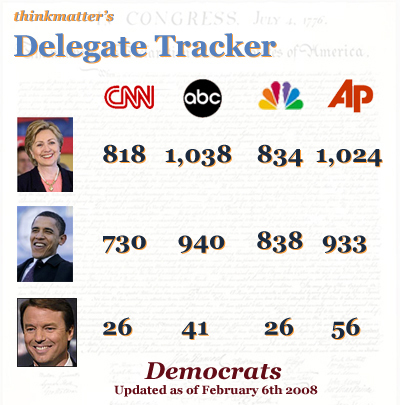 Interestingly, NBC News has Obama edging Clinton by 4 delegates to put him in the lead among Democrats, though the other outlets have Hillary with sizeable (nearly 100 point) leads. 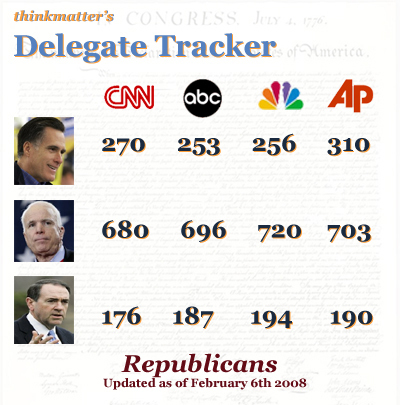 My last update to the GOP Tracker showed that each news source agreed on what the delegate count was as of the end of January, but with the Super Tuesday results they are clearly bouncing around the mark. I’ve been working hard on campaign related issues leading up to Super Tuesday and the posts have fallen a bit behind my regular schedule. I’ll be re-doubling my efforts in the next few days to get my non-award winning analysis out to you in a more timely and reliable fashion. For now, here’s the starting point for the next week or so of digesting just what’s going in the battleground that is the American Political Landscape.